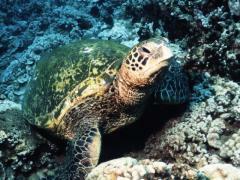 For the first Hawaiian summer of our lives, diving with the turtles isn't our first priority. 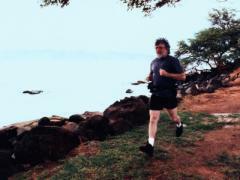 With Peter's heart condition, Job One must always be exercise! Every morning, before we ever get into the water, we work out for an hour-and-a-half. Our cardio portion starts with a two-mile jaunt and ends with 15 minutes of "step-ups". That is followed by a half hour of strength training. Only then are we ready to dive. Our cardio portion starts with a two-mile jaunt. The down side of all this exercising, from a diving point of view? We've lost all our natural insulation! Muscle doesn't keep you nearly as warm as fat. We tried our first dive wearing the usual diving skins that have served us in past years. The result: near hypothermia, followed by a quick trip to the dive shop for neoprene. We may be rubberized now, but at least we're warm. There were some bright spots to an otherwise not-so-stellar early July, however. The turtles accepted our presence as if no time had past since we last met. A few didn't even bother opening their eyes when we showed up! We have known Tutu since 1990 and even back then she sported tags. She's the oldest female we know who resides at Honokowai. Every summer she's at one of two places--either home with us, or away nesting. Last summer, George Balazs confirmed Tutu was at East Island, French Frigate Shoals, doing her part in laying down more turtles. She didn't return in time from her reproductive journey to show up before we had to leave. Tutu accepted our arrival with regal grace. My, but our honu look healthy! It's easy to forget that this was once a 90% FP site with practically every turtle looking back at us through tumoured eyes! On most days now, it's the reverse, 90% healthy-looking turtles and one-in-ten with tumours. We say "healthy-looking" because the vast majority of turtles here are fibropapilloma survivors. That is, they are regression cases. Alas, then some poor soul shows up to remind us of how devastating this disease can be. 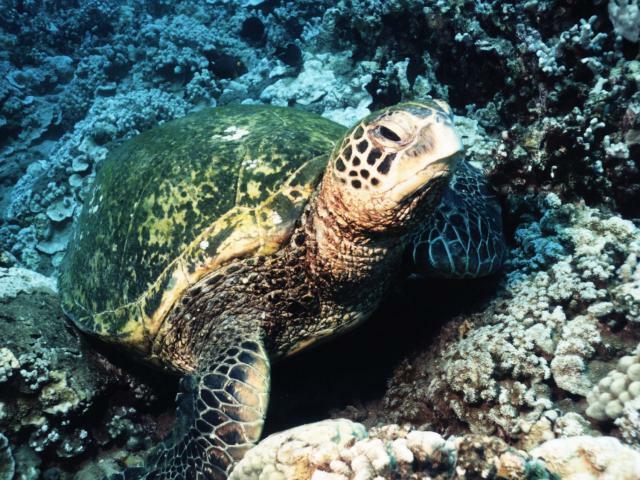 In 1999 we sighted a splendid male honu for the first time. He was as handsome as he was shy. He would not allow close approach so we accepted the fact that it might take several summers to get this turtle to trust us. By 2001, we managed to get close enough to determine that this male was likely an FP regression case even though we never actually saw him with the disease. We were confident his disease days were over and so we named him, "George." 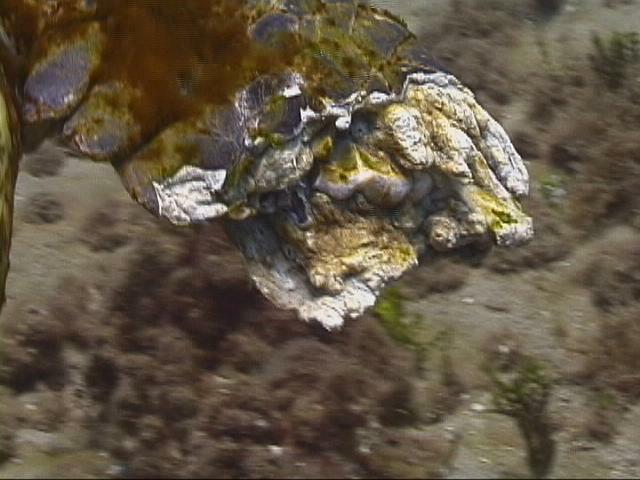 Then 2002 happened, and to our absolute horror we sighted a male with a thick mat of algae fouling his shell, never a healthy sign for any turtle. Worse, his right front flipper had been sheared in half--clearly by a large shark. We could see bone protruding from the flipper wound. Part of the turtle's jaw hung underneath his chin. 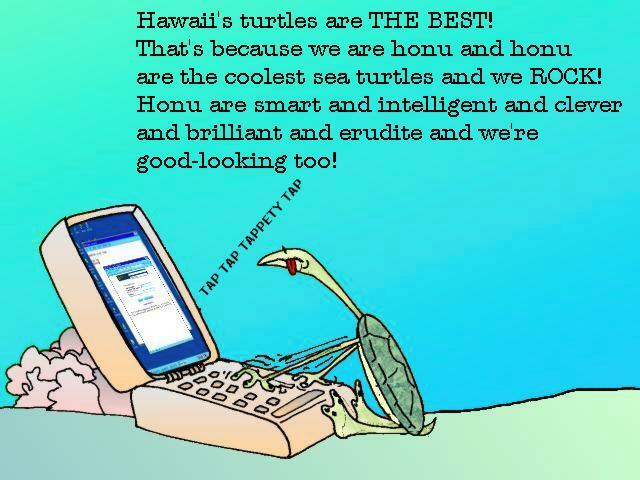 Poor, poor honu! We could see bone protruding from the flipper wound. When we got to our database and tried matching turtles, we were astounded to discover that it was George! The turtle had been in such horrendous shape we simply didn't recognize him as our old friend. Survived FP only to be violated by a tiger shark! What irony. We feared that George was a goner. To our surprise and delight, we sighted George this week. He was resting at East House and looked much better. His wounds had healed and he'd rid himself of the algae that festered his body the year prior. We don't know what effect the partial front flipper will have on George. We don't know what effect the partial front flipper will have on George. We suspect that he won't have much reproductive success (males need both flippers to clamp onto females during mating). We wish him the best though--he's had one rough year. George is testimony to the legendary recuperative powers of sea turtles. 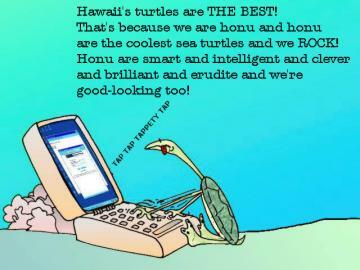 In 1999 we discovered a unique honu hangout. It was a rather large coral head projecting from the sand in the middle of nowhere. Why coral chose to make a stand here is anyone's guess. The first time we saw the thing, it had six green turtles resting around it like planes awaiting departure at O'Hare. Our heads managed to generate two thoughts at this scene. 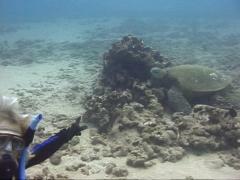 One, how neat it was to see that many honu in such a small area. Two, this coral head's days were limited. Honu are tough on corals and we knew it was only a matter of time before they'd knock it down and then pummel it into rubble. We named the structure "Mt. Balazs" in honour of George Balazs and hoped it would last at least a decade. No such luck. Some time in the last ten months, Mt. Balazs toppled. Actually, that's not accurate wording. 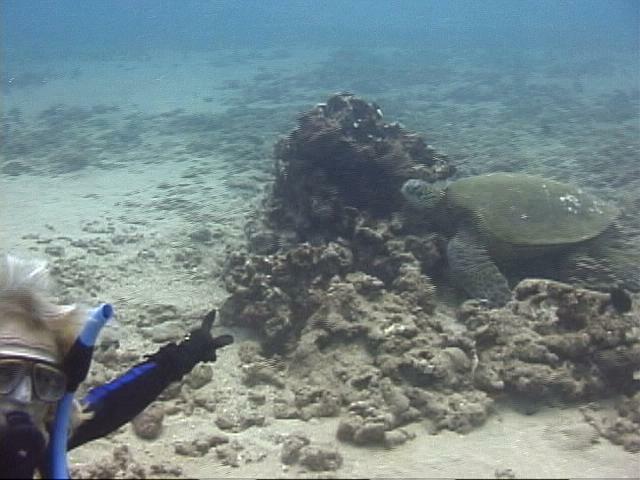 Some time in the last ten months the honu have managed to topple Mt. Balazs! What was at least six feet high in 2002 now only reaches our waists! What was at least six feet high in 2002 now only reaches our waists! This is now the third feature the honu have done in. We'd placed a temperature logger inside Mt. Balazs in 2002, tucking it carefully inside a deep crevice. This week, we found the logger languishing in the sand--and we considered ourselves lucky to retrieve it. Honu do indeed change the landscape! 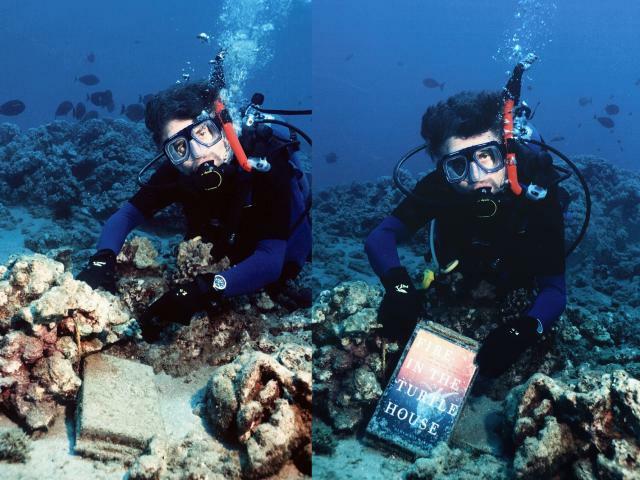 Last summer we encased a copy of the book Fire in the Turtle House in plastic to present to the Honokowai honu. After all, the "Turtle House" that author Osha Gray Davidson wrote about is theirs! We tied the plastic case with book inside to some rubble to the lee of the Turtle House proper. 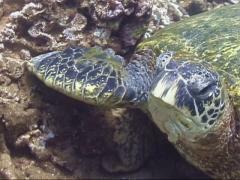 Then we hoped no honu would scratch against it during the day and no tiger shark would swallow it during the night. This week, we visited the Turtle House for the first time in 2003 and were delighted to find the case still very much intact. It was covered with a fine caking of silt but otherwise watertight and in excellent shape! We were delighted to find the case still very much intact. Peter removed the silt, brushed away some of the ocean growth adhered to the plastic, and posed for a photo. 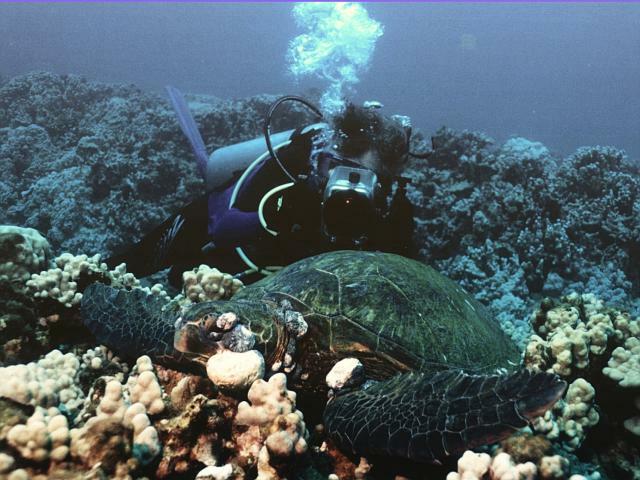 This summer we will present the Honokowai honu with a second plastic case. Inside will be the manuscript for the book we have written about them. Last month, we submitted our proposal to a publisher. We hope it will be accepted. Inside will be the manuscript for the book we have written about them.